Light: Being brave enough to see things as they really are. Exercising your critical eye. Being your own best critic. Acknowledging that things don’t always turn out as planned. Moving past heartbreak to embrace a painful truth. Shadow: Wallowing in despair. Allowing yourself to be completely crushed by the thoughts, words, or deeds of another. Judging yourself too harshly. Holding yourself to an unrealistic standard of excellence. Wearing your heart on your sleeve while carrying a chip on your shoulder. Story: The Main Character sees the error of his or her ways and changes course. Relationships. If things aren’t turning out as planned, it’s time to adjust your expectations…or look elsewhere. Don’t allow rejection to deliver a fatal blow; you’ve lots to offer those who can appreciate it. It’s okay to mourn the loss of a friend or lover—but don’t let mourning become a way of avoiding further growth and new experiences. Work. You may find yourself playing the role of the lone wolf; for now, that’s okay. Things don’t always turn out as planned. Rather than pull out your hair, retrace your steps and identify objectively what went wrong. This information will come in handy in the future. Spirituality. In the midst of heartbreak, it’s not always possible to sit back and ask, “What lesson does Spirit have for me in this situation?” Give yourself time to move past emotional responses; once you do, you can think in terms of what an event might teach you. Personal Growth. If at first you don’t succeed, try again. It’s an old cliché, but an important mantra for anyone determined to make the most of what he or she has been given. If recent efforts have fallen short, you must make a choice: despair…or embody the spirit of determination. Fortune Telling. Breakups and infidelity abound. What hurts now, though, will turn out to be good for you later on. When? Between October 3rd and 12th. The Pierced Heart. 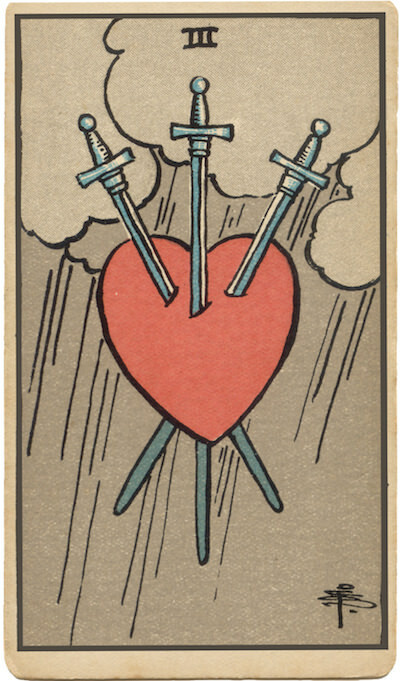 This imagery, adapted from one of the earliest illustrated decks, doesn’t require a great deal of interpretation; it’s meaning is clear to everyone who sees it. In your own situation, what role does disappointment play? The Rain. Few things dampen our spirits like a pouring rain, particularly if we’re already distraught. Talk of silver linings may do little more than irritate us when the clouds are directly overhead. Still, it’s good to realize that the weather will change, and that the rain won’t last forever. Variation from Expectation. Many disappointments are rooted in unrealistic expectations. How might letting go of expectations help you think more clearly about the realities of your situation? The Marseilles Image. The hardy blossom we saw on the Two has been split and destroyed by the arrival of a straight, solid Sword. Have any of your own decisions had unintended consequences lately? How might your own decisions have contributed to the setback you’re facing now? How can I get past my depression? To what extent are my emotions a matter of choice? How can I learn from the mistakes of the past?